The Mipeg X is flexible by its modular design and configurable through the software and user interface. In addition, it is expandable to include sensors, logic modules and features without having to replace the entire system. The software needed to support the upgraded hardware is downloaded via a memory stick. The unit Mipeg X basic system comprises load and overturning moment (optional sensors) together with an angle sensor all mounted on the crane structure. 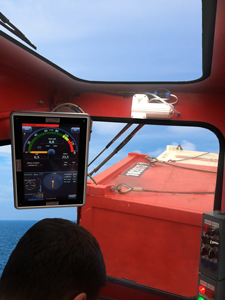 A microcomputer calculates the sensor data and provides a clear image of the crane utilization on the operator's display. The crane's utilization is automatically compared with the crane design parameters permanently stored in the Mipeg's memory and outputs to pre-warn, alarm and shut down functions using kick-out relays or other communication protocols to the crane control system. The system includes a self-diagnostic facility to identify any system irregularities. Additionally, the monitoring feature provides vital information needed to enter a planned maintenance schedule based on crane usage. The logged data may also be used in incident investigations. The Crane Operation Records are downloaded to a USB memory stick or transmitted to the facility network using other communication channel. 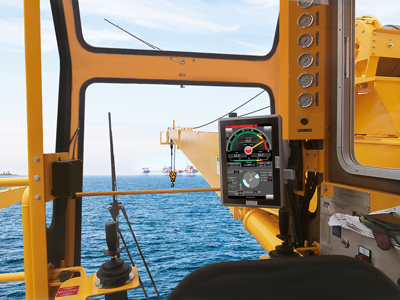 The Mipeg X has many "on-board" help features such as step-by-step procedures, manuals and drawings reducing the guesswork, helping you to achieve crane safety. The Mipeg X is expandable and new features will be released as required by the industry. Below is a list of features currently available.